Welcome people into your kitchen or dining space with this wall sign. A cute reminder to eat and be merry. The perfect farmhouse kitchen decoration to complement the country, primitive, decor theme you have in mind with it's white letters and distressed wood finish. An ideal rustic wall decor for any kitchen or dining room. Use it at your next family gathering, it will definitely add a cheerful look! Dimensions: Overall Size: 24" x 8" x 1.25". Individual Tile Size: 8" x 8" x 1.25"
EAT SIGN DECOR - Welcome people into your kitchen or dining space with this wall sign. A cute reminder to eat and be merry. Kitchen decor that makes a beautiful adornment. 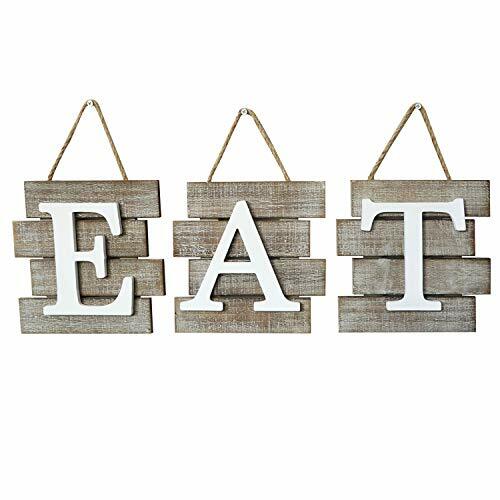 RUSTIC WALL ART - This wall decor sign is the perfect piece to complement the country kitchen theme you have in mind with it's white letters and distressed natural wood finish. READY TO HANG - Easy to hang with hanging strings that make this wall house decoration so easy to mount. A shabby chic home decor item for that farmhouse look. KITCHEN WALL DECOR ACCENT - Ideal decoration for any kitchen or dining room. Use it at your next family gathering, it will definitely add a cheerful look. DIMENSIONS - The overall size of this rustic wooden wall sign measures 24" x 8" x 1.25". Each tile measures 8" x 8" x 1.25". Letters can be hung individually. If you have any questions about this product by Barnyard Designs, contact us by completing and submitting the form below. If you are looking for a specif part number, please include it with your message.